Maple Grove Candy Maple Santa ships in November. Maple Grove Candy Maple Santa. This item is only available to ship in November and December. 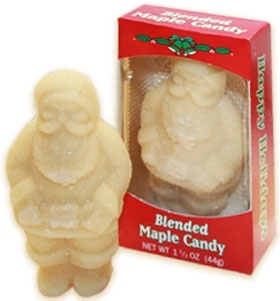 Whimsical blended maple candy Santas delight "kids" of all ages! These plump and merry candies add a jolly touch to packages, stockings or under a pillow on Christmas Eve. Santas are 1.5 oz each.